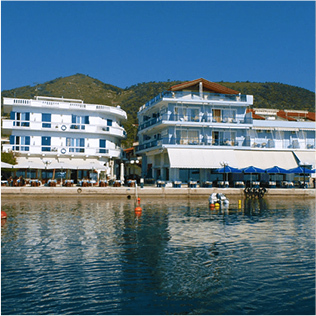 Hotel George epitomizes the Greek village experience, located peacefully on the sea in the port of the quaint fishing village of Ancient Epidavros. The ambience of George's is not to be underestimated. Unspoiled and away from mass tourism, George's sits next to a bay of morning sunrises, afternoon sail boats lazily making their way to shore and evening magenta colored sunsets which can be viewed against the backdrop of the sleeping volcano of Methana. Here you can lose yourself on a nearby beach, excavate your way through ancient ruins or explore the quaint village and its colorful inhabitants. Hotel George provides a peaceful setting for yoga and meditation with culture and activities only a stone's throw away. The Mangelis Family has owned and operated George's for generations, and they have an acclaimed reputation for the finest seaside and Greek vegetarian cuisine in the village. Each meal is made with fresh ingredients and is born from the Mediterranean traditions, which balance the body, mind and soul. If you happen to be interested in culture and history then monuments of world heritage are steps away. The rooms are simple and clean with a Mediterranean feel. 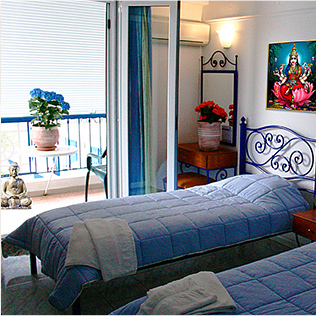 Most rooms offer a view of the sea and a balcony, and gentle waves can be heard through the open windows. Single, double and triple occupancy are available. The yoga shala located on the rooftop of the hotel, offers gorgeous views of the sea below. The space can be open to the warm breezes off the ocean, or protected from the elements with transparent closures as to not obstruct the extraordinary views. Buoys bobbing quietly below and the chime of the church bells lure in a meditative connection between local elements and spirituality. 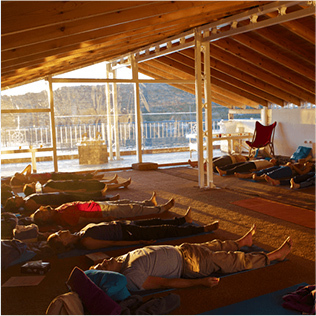 The newly constructed shala easily accommodates up to 40 yogis making George's this location the perfect place for week-long retreats or month long teacher trainings or workshops. Close to Hotel George, there are many activities to choose from. Fishing, boating, kayaking, bush walks, archeological walks, and mountain biking are easily available. Accessibility to the sea, to Athens and to many of Greece's most important ancient sites including the Theatres and Asclepion of Epidaurus, Mycenae, Tyrinth, Corinth, Argos, Nemea and the Palamidi of Nafplion, make Hotel George a very special place to hold a retreat. If you happen to be interested in the culture and history of the area, then world heritage monuments are a stone's throw away. The world-famous attractions of Argolis (Epidavros, Mycenae, Tiryns, Nafplion, Corinth) and Athens are near. Day trips to Poros, Hydra and Spetses, epitomizing the Greek Island experience, are possible too. Dive into the local flare in the nearby village, which includes small shops, bakeries and seaside walking paths. A visit to the local amphitheater, dating back to 4th BC is an easy ten-minute stroll away through orange groves and olive trees.